MATATU CASHLESS SYSTEM CHALLENGED IN COURT. Lawyer Harrison Kinyanjui with member of bus owners outside Milimani Law Court. FEW hours before the requirement for all PSV Vehicles to install a cashless payment system on their vehicles, the hearing on the same is set for tomorrow even as Matatu operators challenge the new regulations in court saying that there is no regulatory framework for the Near Field Communications System devices which are required for a cashless payment system. Through their lawyer Harrison Kinyanjui the stakeholders argue that it is only the central bank of Kenya which has mandate to operate the Cashless-Payment System. “Article 232(2) of the constitution designates the Central Bank of Kenya (CBK) as the sole entity responsible for formulating monetary policy, promoting price stability, issuing currency and performing other functions conferred by an act of the parliament.” Submits Lawyer Kinyanjui in is submissions. They argue that the transport Cabinet Secretary and NTSA cannot usurp the role of CBK as envisaged under the Central Bank Act. Stakeholders have raised concern over security mechanisms of the system and cost imposed by the new cashless payment system. They insist that Public Transport industry is already overtaxed by the Government and that the ministry is keen on driving them out of business to create room for preferred operators. The matter which is scheduled for hearing tomorrow before Justice George Odunga was filed in March this year where bus operators moved to court to also challenge night travel ban. Lawyer Kinyanjui further submit that, the implantation of such “cashless” fare payment system further demands the erection of security mechanisms which must factor into the operability of the system an analysis of cost of costs versus benefits. He also added that parliament was not given opportunity to scrunize and debate on the costs imposed by such a payment system and who is to bear the infrastructural costs Kenya was supposed to implement the cashless fare system on July 1 however; the Matatu Welfare Association has asked the Kenyan government to give them more time to implement the service, citing lack of awareness in the general public. Matatu owners in Nakuru have asked the Transport Cabinet Secretary Michael Kamau to suspend the implementation of the cashless fare payment system set to be adopted by all Public Service Vehicles (PSV) and address their concerns first. Citing lack of public awareness, high cost of the new equipment among other impediments, the owners said they are already reading mischief in the speed with which the government is using police crack downs in Nairobi to push for compliance. Representing the over 4, 000 matatu owners in Nakuru town, Nakuru Central Matatu Sacco chairman Steven Muli argued that they need more time as the system is new and the process of fixing the new digital equipment is equally time-consuming and expensive. The matter to be heard tomorrow before justice Odunga. 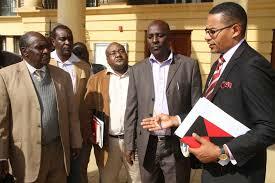 KAJIADO COUNTY SERVICE BOARD JOB ADVERT CHALLENGED IN COURT. Lawyer Pauline Muhanda with some residents of Kajiado West Constituency leaving Milimani Law court after court directed they be given names and ranking of the applicant for the positions awarded to Ewuaso OO Nkidong’I and Keekonyokie wards of Kajiado County. High court has ordered the Kajiado County government to provide the names and the ranking of the applicant for the positions awarded to Ewuaso OO Nkidong’I and Keekonyokie wards in county service board pending the hearing and determination of the application filed in court on Friday. Justice Lenaola granted the petitioner the order on Monday morning and directed the the Kajiado county government to respond to the application within 14 days and appear in court on 14 of July for inter parties hearing. 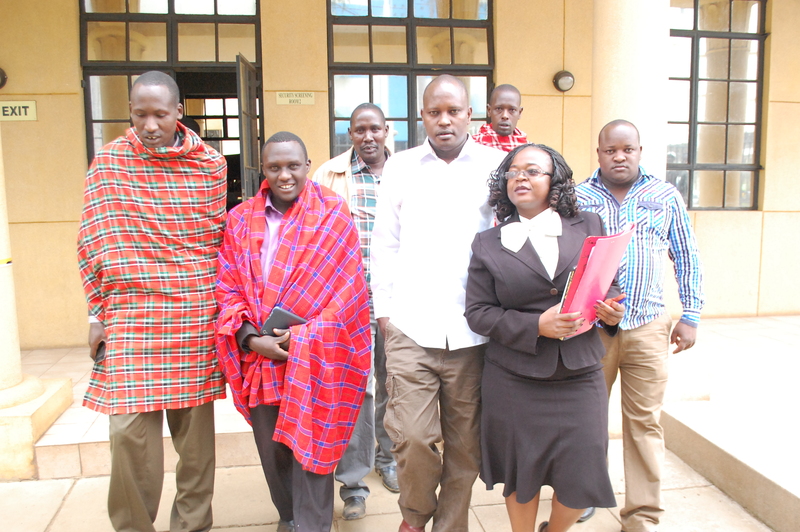 Residents of Kajiado West Constituency moved to court on Friday seeking orders to nullify all the appointments made by their County government. The fifty five applicants who are residents of Ewuaso OO Nkingo’I and Keekonyokie wards allege discrimination in the public appointment by the Kajiado County Service Board, saying there has been unfair distribution of employment amongst their community. The applicants James Tinai Murete and Gideon Meyoki who represents their colleagues in the petition says through their lawyer Pauline Muhanda that the county government of Kajiado did not advertise for the 24 vacancies and the applicants were the first to apply. for the consideration of persons with disabilities. were completely marginalized in the recruitment. The court heard that the applicants are so disadvantaged due the fact that the members of County Assembly (MCAs) representing their wards are from the dominating Odo Mong’I clan. discriminate upon them as a clan and their constitutional Rights to equality an freedom will violated as happened before. “As a clan will stand discriminated upon by the county government for many years to come unless the court intervenes” the lawyer said. The matter to be heard on 14 of July for inter parties hearing. POLITICAL ACTIVIST MOSES KURIA ARRAIGNED IN COURT OVER HATE SPEECH. 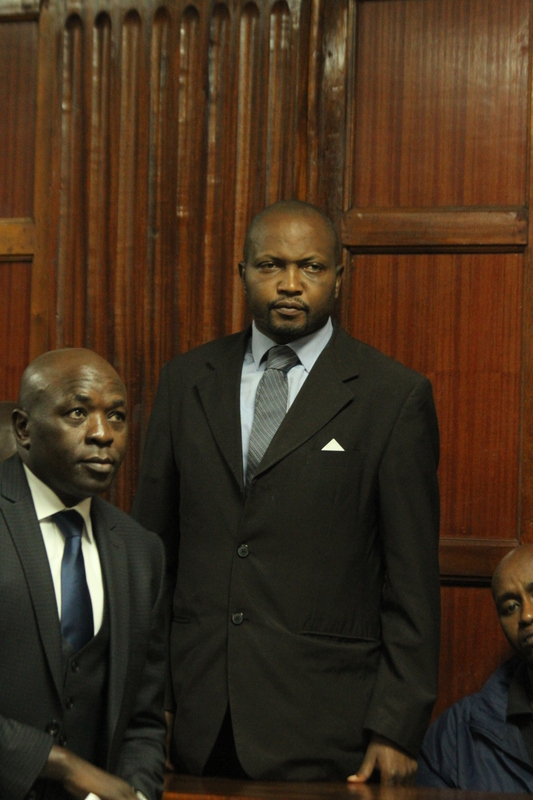 The National Alliance party Gatundu south aspirant and political activist Moses Kuria with his lawyer Cliff Ombeta in a court room at the Milimani Law Court in Nairobi 26/06/2014. The National Alliance party Gatundu south aspirant and political activist Moses Kuria was Thursday morning charged with hate speech in a Nairobi Magistrate court. He appeared in the Nairobi Chief Magistrate’s court, denied the three charges and was he was released on a cash bail of two million shillings or an alternative bond of five million shillings. Mr Kuria is charged with incitement, hate speech and causing ethnic contempt in Facebook messages allegedly posted on May 16. Kuria on May 16 posted on his Facebook page: “I think it is only a matter of time before Kenyans start violence against PERCEIVED (sic) terrorists, their sympathizers, their financiers and those issuing travel advisories without intelligence. I am not sure I will not be one of those Kenyans. When you touch Gikomba, the nerve centre of our economic enterprise, you really cross the line. Brace yourself. Choices have consequences,” Kuria said. He had been summoned to appear before the court on the recommendation of the National Cohesion and Integration Commission after complaints by Law Society of Kenya. LSK had said the Facebook posts were intended to incite the public to violence against a specific community. On Tuesday, the political activist won the National Alliance (TNA) party nomination to contest in the Gatundu South parliamentary by-election set for August 7 a move that has been protested by some of TNA party members of the parliament. Eighteen senators and National Assembly members are today expected to record statements with police over alleged hate speech linked to recent political rallies. The Director of Public Prosecutions (DPP) Keriako Tobiko ordered the lawmakers from both the ruling and Opposition coalitions to record statements with the police following complaints from unknown parties. Several politicians may face the same charges over their utterances they have made in different occasions in the political rallies around the country. The matter will be heard on 2 September and mentioned on 10 of July 2014. ARREST WARRANT FOR KETHI DESPITE ORDERS STOPPING HER IMPENDING TRIAL. 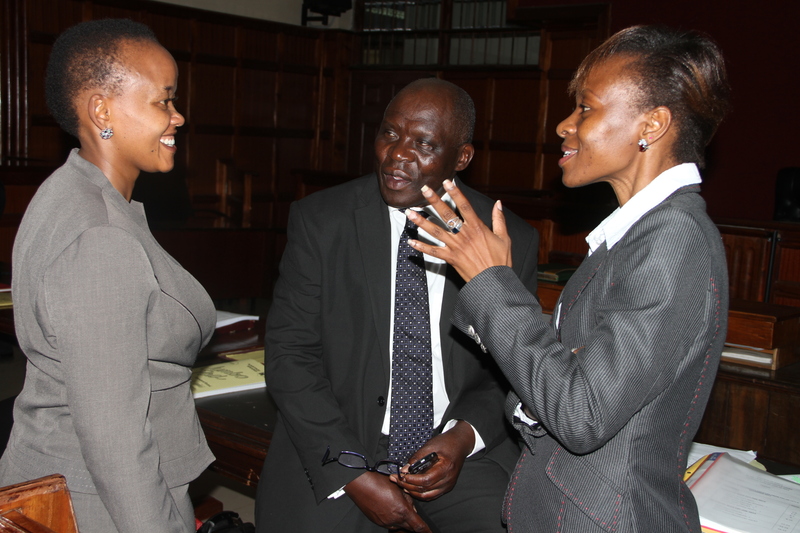 Lawyer Kethi Kilonzo chats with her Lawyers Fred Ojiambo (center) and Julie Soweto in a courtroom at a Milimani court on Tuesday, 18 Mar 2014. A Nairobi Chief Magistrate issued a warrant of arrest against Lawyer Diana Kethi Kilonzo after she failed to appear in court for her criminal case. Chief Magistrate Hannah Ndung’u issued the warrant of arrest in a suit of arrest in a suit where Kethi is accused of stealing a voter’s registration acknowledgement slip. This comes even after Lawyer Kethi Kilonzo on Monday got temporary orders from high court in her renewed attempt to stop her prosecution in a case in which she is accused of stealing a voter’s registration slip. High Court Judge Justice Msagha Mbogholi granted Kethi stay orders pending the hearing and determination of a case before the court. Kethi’s trial was set to commence today before Chief Magistrate Hannah Ndung’u but Justice Mbogholi granted her the stay pending the determination of an application she filed on Tuesday last week citing the conduct of the proceedings as being oppressive. Through her lawyers Fred Ojiambo and Julie Soweto, she claimed that she has not been provided with a copy of the witness statement and other relevant documents to prepare for the case against the Independent Electoral and Boundaries Commission (IEBC). In his ruling Justice Mbogholi said the trial in the lower court shall not commence until Kethi’s application is heard. He directed the chief magistrate to avail the file before the High Court without any further delay to enable it determines the matter. On June 19, the Deputy Registrar wrote to the Chief Magistrate calling for the magistrate’s court to produce the file but it has not been availed before the High Court since then. In the application Kethi’s defence team alleged that the prosecution has continued to contravene her constitutional rights by keeping her in the dark by failing to supply her with all the documentary evidence it seeks to rely on during trial. “In the circumstances we have no option but to obtain a stay of the lower court proceedings until the application before the High Court is heard and determined,” Soweto stated in the application. Lawyer Soweto further told the court that since the case was lodged against her client in September last year she has not been issued with witness statements despite several appeals by her counsel to move the prosecution so that she can prepare her defense. Kethi was charged in September last year alongside former IEBC official Godfrey Lempiso for the theft of a voter registration slip valued at Sh5. Her trial was meant to start in March after the chief magistrate ruled that the court did not have the jurisdiction to stop the proceedings. She asked Kethi’s defence team to contact the Independent Electoral and Boundaries Commission for the documents her team wanted to rely on during trial. However Kethi’s defence team moved to the High Court after it accused the prosecution of disregarding a court order that was made on September 3 last year by the then Chief Magistrate Kiarie Waweru. He further alleged that the Director of Public Prosecution’s office has failed to respond to 11 requests they had made over the supply of all witness statements and exhibits it seeks to rely on during trial. Justice Mbogholi on Monday directed the matter to be mentioned on July 10 to confirm whether the orders have been complied with. 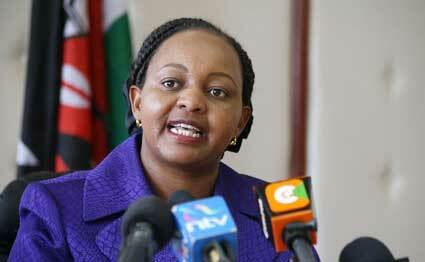 INDUSTRIAL COURT STOPS CS WAIGURU. Devolution Cabinet Secretary Anne Waiguru. Devolution Cabinet Secretary Anne Waiguru has been sued by two activists in a Nairobi base court. Industrial Court certified the application as urgent and directed the Petitioners to serve all parties. The Industrial Court Lady Justice Maureen Onyango also temporarily suspended the document titled, Policy on Decentralization of Human Resource in the Civil Service, dated May, 2014 that gave Ms Waiguru the authority to hire and fire public servants pending the hearing inter-parties and determination. Activists Okiya Omtatah and Wycliffe Gisebe moved to court to challenge decision by the devolution CS over the removal of Mr Gor Semelang’o, chairman of the Youth Enterprise Fund and Mr Kiplimo Rugut, Director General of the National Youth Service (NYS). They said CS Waiguru acted in gross violation of the Constitution on employer-employee relations. The document filed in court says that Kinyua ought tom have been vetted by Parliament before assuming any governance responsibility. Principal Secretary, Planning, Peter Mangiti is sued for being incompetent vide abdicating his obligation by purporting to have been instructed by an mysterious body to upshot removals, appointments, and transfers of workforce under his management contrary to laid down procedures in the civil service. Head of the Public Service Commission, Margaret Kobia has also been sandwiched in the suit as the one who chairs the statute body that establishes and abolishes offices in the public Service. Kobia is said to have powers to sign up persons to grip office, to confirm appointments as well as exercise disciplinary control. Mr Gor Semelang’o was sacked in March while Mr Rugut was transferred from the National Youth Service to the ministry of sport in May. However, Ms Waiguru has been categorical that she did nothing illegal. The removal of the two senior civil servant resulted in MP Mithika Linturi’s move to have her impeached but the motion collapsed after Linturi failed to appear in the parliament. This is the second time such suit after two youths went to court seeking to rescind the degazettement of Mr Semelang’o two months ago. Motion to impeach Devolution Cabinet secretary Anne Waiguru came a cropper after its sponsor Igembe South MP Mithika Linturi failed show up in the National Assembly. The matter to be heard inter parties on 1st of July, 2014. COURT ACQUITS LOCAL ARTIST JOHN DE MATHEW. Local artist John Ng’ang’a popularly known as John De Mathew with his lawyer Abiyu Kamau outside high courts building at the Milimani law courts in Nairobi Friday 20/06/2014. A local artist accused of propagating hate speech in one of his songs ahead of last year’s general election was acquitted on Friday by a Nairobi Magistrate court. John Ng’ang’a popularly known as John De Mathew was accused of allegedly singing the song Mwaka wa Hiti (The Year of the Hyena) in Kikuyu language that bordered on ‘hate speech’ against former Prime Minister Raila Odinga, who was one of the contenders for the top seat in 2013-elections. Acquitting the accused Senior Principal Magistrate Ellena Nderitu said she did not find any inciting statements in the song produced in 2010. Ms Nderitu said the court established that the prosecution did not present enough evidence to link the artist with hate speech in his song. 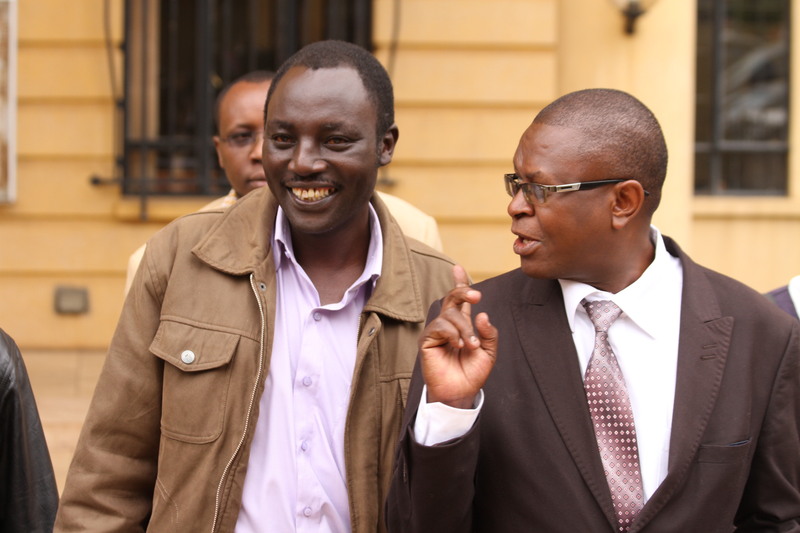 “After perusing through the file and listening to submissions by the prosecution and the defence this court found no evidence to link the accuser’s song to the hate speech charges leveled against him as he never mentioned any tribe in his song,” ruled Nderitu. The Mugithi singer was charged in July 2012 at the height of political campaigns ahead of the General Election earlier anticipated to take place between August and December 2012. This is after the then Chairman of the National Cohesion and Integration Commission Mzalendo Kibunjia ordered an investigation in to the songs ‘Mwaka wa Hiti’ composed by De Mathew, ‘Hague bound’ by Muigai wa Njoroge, and ‘Uhuru ni Witu’ by Kamande wa Kioi. He was charged alongside prominent Kikuyu musicians colleagues John Muigai wa Njoroge and Kamande wa Kioi for incorporating hate speech in their songs. The commission hired the services of a certified translator to interpret the three vernacular songs and determine whether, as claimed, the songs contained tribal, divisive and inflammatory messages. The commission even threatened to ban the music if the probe established that the songs violate the National Cohesion and Integration Act. However, the cases never took off for some time and no witnesses were called to testify and this prompted Kioi and Njoroge to write to the NCIC on January 28 and February 22 last year asking for an out of court reconciliation which was granted after they said a peace deal with the NCIC. De’ Mathew however was not party to the agreement with the NCIC and vowed to press on with the case until his name was cleared by court. Speaking to the media after his release De’ Mathew who started singing in 1987 pledged to use his talent as a secular musician to promote unity and cohesion among communities by rallying them against negative ethnicity. “At last justice has been done and I am very happy that the court has vindicated me of the charges. I undertake to preach peace and unity in my music,” De’ Mathew said. He said as a local artist he was encouraging communities in development activities and encouraging the youth to shun illicit brews. If found guilty, the musician risked to serve a three-year jail term or a fine of about Sh 1 million. MOI TO BE CALLED TO GIVE EVIDENCE IN LAND CASE. 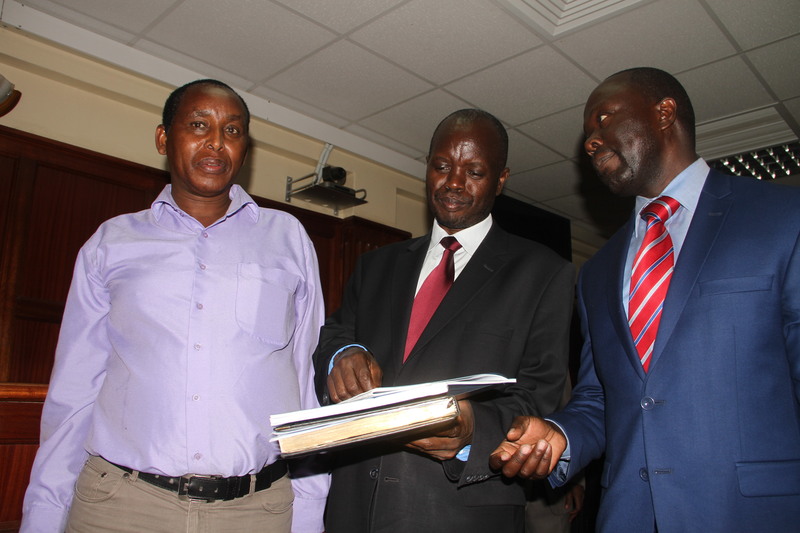 Lawyer William Arusei, (center) talking to businessman Simon Laboso (left) and Lawyer Donald Owang (right) outside a courtroom at Milimani Law Court on Monday 16/06/2014 after the ruling on application on the land in dispute biting former president Moi and four businessmen. High court judge Justice Pauline Nyamweya consequently declined to struck out the case brought against him, Tulip Properties limited, commissioner of Lands and the registrar of tittles on grounds that the court will arrive at the conclusion after such evidence has been tendered. ”It’s evident that both Moi and Laboso and colleagues were allocated same parcel of land which the court need to be proved to demonstrate their respective cases” the court said. The judge said each party has claim that title held by them is irregular and illegal and they have filed on oath certain facts in defence of their respective tittles. Justice Nyamweya found and held that there are tribal issues raised by both applicants and defendant questioning how their respective tittles were obtained and it will require further evidence to be called for their determination. Moi through his lawyer Juma Kiplenge had sought to have suit filed against him by Mohamed Korrow Simon Laboso, Macdonald Lijoodi Maraka and Noor Mohamed Hassan struck out claiming that he his proprietor of the multi million shillings property registered under LR No 1477 allocated along Mombasa road. However Laboso and his co-applicants through lawyer William Arusei, told the court that the defence filed by Moi seeking to struck out the suit is contains mere denial and does not disclose no semblance of reasonable facts which the court is being asked to rely on. He said the defence filed by Moi is violation of the mandatory provision of the procedure rules, saying it’s irregular, fatally defective and amounts to abuse of the process of the court. Arusei told the court his clients having been allocated the suit land a paid the necessary stand premium and stamp duty, the allocation to the same property to retired head of state and subsequent transfer to Tulip Properties limited was illegal and the court should find so and revert back the land to the applicants.